Historically, the Dutch have been a bit map-obsessed you could say, influenced both by a need for world maps, to lead the global navy conquests and trade, as well as local high-precision maps, to end disputes between people in an overcrowded little country. The fact that the three major navigation data suppliers (TeleAtlas, NavTeq, AND) were founded in Holland should therefore not come as a surprise. This aptitude for maps, combined with an already high adoption rate of social media and the mobile web, results in a steep adoption curve of location based services. For some numbers, we can look at research done in Germany, a very similar market in terms of adoption of innovation. Here we can see that almost half or the population uses LBS frequently and most people that use them consider them very valuable. What’s hot and what’s not in Holland? Most people use mobile LBS for things as mapping (70%) and navigation (46%), clearly services that have been making our lives easier th past decade. Upcoming services are those related to local buying decisions, such as reading restaurant reviews (38%) locating nearby convenience services (36%) and shopping with special offers / coupons (33%). A smaller, but growing fraction of mobile consumers is eager to share personal location in order to get some form of benefit. These location based networking tools are quite popular in The Netherlands. Concerns cited are privacy of and control over personal information, as evidenced by the recently blown up incident concerning Apple phones collecting and storing location data. These concerns differ greatly between the US and Europe, but also between countries in Europe, where Germany is almost paranoid about their privacy and the Dutch are more laid back about their personally identifiable information. However, looking at the growth rates of Google, facebook and Twitter in Europe, I tend to consider these concerns as temporary speed bumps in the adoption of social location sharing. There is simply too much money at stake from brands trying to reach the mobile consumer at his point of purchase. As the benefit grows for which consumers are seduced to ‘transact’ their privacy, these barriers will fall. If you follow the various Web 2.0 blogs, like Mashable and TechCrunch, you can’t escape the hype around location based (mobile) advertising. It’s alot harder to find a consistent way of measuring the advertising spend without a clear definition. At the Location Based Marketing Association, we define LBM as “all avenues of advertising and marketing as it relates to location-specific opportunities”. This community is comprised of mobile, out-of-home, digital and print advertisers. From this perspective, the potential opportunity in The Netherlands is almost 30% of the total (~4.3 billion €) advertising market. For commercial purposes, I like to narrow it down to the local (online) search, mobile, social media and digital screen spaces only. 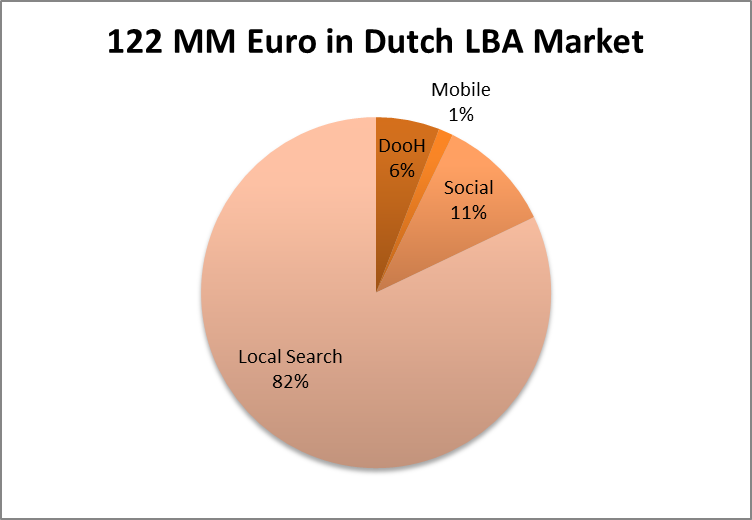 Using some numbers from 2008-2010, we’re talking about a figure of around 122 MM euro, which comes from ~92MM in local search (considering 20% of search is local), ~1.5 MM mobile (2.5% of online advertising), ~22 MM social media and ~6MM DooH (4% of the out-of-home market). These numbers are extremely conservative. The growth of technologies and applications for ‘social location sharing’ have been much covered by marketing and technology press, some research estimating the total US market potential to range into $10 Billion by 2016. Translated to the Dutch market, this would mean a pure-play location sharing market of around 340 MM euro. Without basing this on any specific research, my experience tells me all Western European markets (UK, France, Germany, Benelux, Nordics) share a similar delay in the adoption of technology innovation of around 9-12 months with the US. The ad spend spread is almost exactly the same as in the US. So who are the key players, advancing the location based services technology in Holland? Obviously this depends on how narrow you define LBS, but let’s zoom in on location based networking. Recent research we’ve done shows that Google Latitude and Facebook places are the new LBS platforms to watch across Europe. Nearly 2% of foursquare’s 9 million users come from NL, but the more interesting number is the 14 million people using Facebook or Hyves; social networking hubs that have added check-in functionality as of recent months. Gowalla and Feest.je (a local player) both have about 15k users in NL. 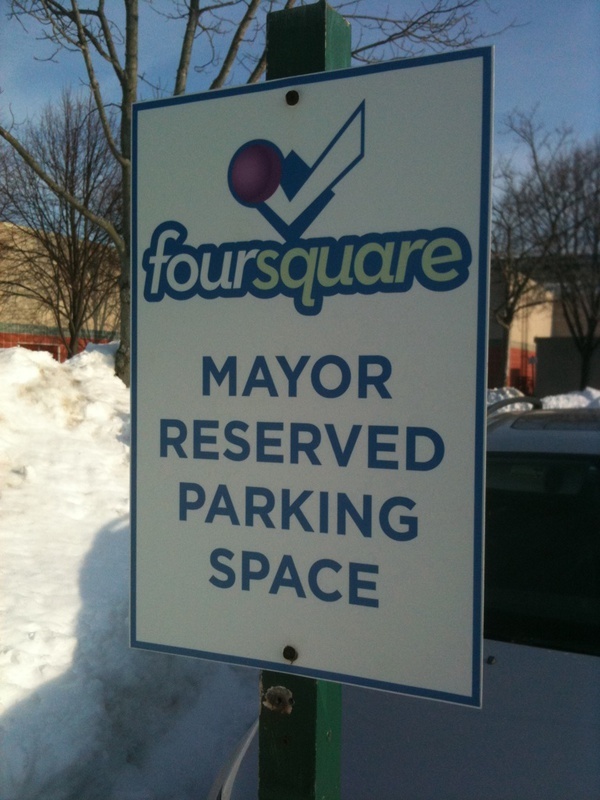 I think for both markets only foursquare is a real contender to the massive powers of Google, Twitter, Facebook and Microsoft. The latter may look surprising in this list, but shouldn’t be disregarded considering its significant advantage in this space through its recently announced cooperation with Nokia. Next to our widely diversified postal- and address coding systems in Europe, the different implementation of the 1995 EU Data Protection Directive has been slowing down adoption of location based services. Where the first are causing ‘only’ technological issues (through the expense of geocoding data), the privacy laws are more difficult for vendors to tackle, because it involves a redesign of tools & processes for each country. My hope is that (by upholding firmly) the new EU standard will help spread the benefits of new technology faster, by better facilitating international vendors to target and penetrate the EU market. My fear is that, again, the discretionary powers of member states will result in another checkerboard of rules throughout Europe, further distancing us from the BRIC countries as attractive markets to invest in. Repudo, a location based service with which you can drop all kinds of multimedia like a text, a photo, a video or an audio message at any location you like, adding a layer of digital objects to the real world. Whatser, a personalized networked city guide reflecting your taste and preference in the city where you live, work or simply love to hang out in. How to get into the LBS Game? 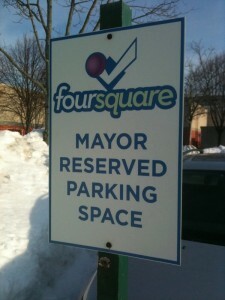 For brands, retailers and other advertisers, the location based marketing “game” is just starting. So it’s still exciting and sometimes frightening to be doing anything in this space. Experiments are in order, but need to be controllable from both a cost- as well as impact perspective. It’s relatively easy to get your feet wet through a simple foursquare campaign as McDonalds proved. But you have to design the campaign with a ROMI in mind. Second, that result you’re looking for, may be just the analytics or just the PR. But if you don’t have the tools to measure, you will not have a means to evaluate success or failure. Getting yourself setup with some local/social media listening tools before you run a campaign is very important. It helps you understand which platforms to use to reach your intended audience, as well as listen to and engage with the audience your message or promotion was targeted at. Finally, my advice would be: come talk to us! We have a clear overview of the players, potential and products in this market and can help to make some ‘beans’ of the ‘spaghetti’. The challenge is that this market combines business models and technologies of the almost-forgotten (navigation and mapping) with the near-futuristic (‘minority report’ personalized digital screens). We can help integrate the complexity into a solution that supports marketing goals.